Identifies optical fibers by detecting the optical signals being transmitted through a single-mode fiber. The FI-10 and FI-11 Optical Fiber Identifier are rugged, handheld, easy-to-use installation and maintenance instruments that identify optical fibers by detecting the optical signals being transmitted through a singlemode fiber. 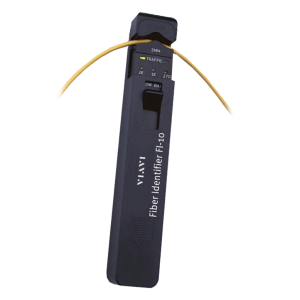 By utilizing local detection technology (non-destructive macro-bend detection), they eliminate the need to open the fiber at the splice point for identification. This, in turn, eliminates the probability of interrupting service.